The festive Praeludium in C is especially attractive with its virtuoso pedal writing and repeated-note fugue theme. The pedal solo in the Praeludium in B flat is, if anything even more virtuosic. Together with the downright weird fugue subject it would combine to make a very attractive piece, but for a slightly perfunctory conclusio. It is interesting that none of the three Praeludia follow the typical Buxtehude five-part pattern. That in C major is really a Prelude and Fugue, the B flat major example follows the Tunder three-part pattern, (Expositio, Narratio, Conclusio), but on a larger scale than any of Tunder�s examples. The third example, in E flat, contains no fugal material at all, and is the least interesting of the pieces. Of the chorale-based pieces, Wie sch�n leuchtet der Morgenstern is a short chorale fantasia, while Von Gott will ich nicht lassen is a partita consisting of very short variations. It reminds me rather of the piece on Nun komm der Heiden Heiland by another all-but-forgotten composer of the time, Andreas Kneller. Leyding however, is, as a result, the only composer from this �school� I can think of, from whom both chorale fantasia and multi-verse settings of chorales survive. Can anyone enlighten me further? The coupling, the far better known complete organ works of Nicolaus Bruhns, is notable for the inclusion of an unknown Adagio in D. This is two minutes of durezze e ligature style writing, which must surely come from another piece. Unfortunately this is the only remarkable feature of the Bruhns. Friedhelm Flamme�s playing, despite his obvious digital dexterity rather flatters to deceive through over-complex - and often unconvincing - registrations, a rather one dimensional approach to articulation, and a dubious handling of time signatures. The two fugues of the G major Praeludium are taken at almost identical tempi despite the completely different notation. Additionally I find his feeling for different affects somewhat lacking. The result on the whole is just rather dull. The organ however is anything but. Bernhard Edskes�s 2000 reconstruction of Christian Vater�s 1724 three manual instrument in Melle is an instrument of extreme quality, with scintillating choruses and beguiling reeds. Vater was a pupil of Arp Schnitger and the instrument features only minor departures from his style. 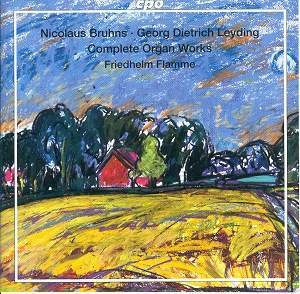 Buy this to acquaint yourself with the very interesting music of Georg Dietrich Leyding. Jansen�s playing is entertaining, if a little wild. The organs are impressive as are the stunningly musical performances of La Parlement de Musique. Additionally this is the only recording to offer �Nun Komm der Heiden Heiland� in both the Walther and Agricola manuscripts. (Flamme plays only the Walther copy). Porter plays expansively, but musically in this release featuring the seldom played chorale preludes of Hanff and the marvellous Rottenstein-Pock organ of 1554.